Top Performers: Is David Bromberg the Next Kris Johnson? Below are the pitching Game Scores* in the Pittsburgh Pirates’ farm system from the last week. The top ten and the bottom five starts are broken down below the chart. The top five short season pitchers are also highlighted in a separate group, since most of those guys only go 4-5 innings max, and don’t have a good chance of being highlighted in the top ten. The rankings include every pitcher who made a start for a Pirates’ minor league affiliate, with no limitations on whether the starting pitcher has prospect eligibility. David Bromberg put up the best game score of the season this week. The top ten had some impressive starts this week. Bill James characterizes any game score of 65 or better a “gem”. The Pirates had ten “gems” this week, including the best game score of the season. That score came from David Bromberg, who threw eight shutout innings, giving up a walk and two hits, and striking out seven. Bromberg has been outstanding for Altoona this year, with a 3.32 ERA in 119.1 innings, along with a 114:45 K/BB ratio. He also made two starts with Indianapolis, giving up four runs in 10.2 innings, with three walks and eight strikeouts. He ultimately profiles as upper level depth. Then again, Kris Johnson looked the same way at this time last year, then was re-signed early, had a great off-season, and just made his major league debut last night. So it’s tough to rule anything out for Bromberg, but he’s still got an uphill battle, especially since he’s right-handed and Johnson is a lefty, giving Johnson more opportunities. Pat Ludwig has moved to the Bradenton rotation in the last month, and has been putting together some impressive starts. He threw seven shutout innings last week, with two hits, one walk and seven strikeouts. That gave him the second best game score. Ludwig had struggled in his previous three starts, but had four earned runs in 13.2 innings in three starts before that. His upside is middle relief. John Kuchno had the third best score this week, continuing his hot run since the start of July. Kuchno has a 2.03 ERA in 40 innings over his last seven starts, with a 30:10 K/BB ratio. He struggled early in the year, especially with his control. However, he has turned things around in the second half, much like a lot of the other young West Virginia starters. Kuchno profiles as a power reliever in the long-term, and will remain in the rotation until he reaches a level where there are better arms to take away his innings. The fact that he’s in this rotation says a lot about his arm and upside right now. Shane Carle, taken in the tenth round of the 2013 draft, had the best start of his career. The sinkerball pitcher threw seven shutout innings, giving up four hits and a walk, and striking out four. That tied for the third best score with Kuchno. Carle has a 2.12 ERA in 46.2 innings this year, along with a 39:4 K/BB ratio and a 1.97 GO/AO ratio. Eliecer Navarro has struggled at times since moving up to Altoona, but had a good start this week. Navarro went 5.2 shutout innings, striking out seven in the process for the fifth best score of the week. If the need for pitching depth came on Saturday, Brandon Cumpton might have been the guy to be called up instead of Kris Johnson. Cumpton threw Saturday night, and went eight innings with just one unearned run allowed. Cumpton, Johnson, and Stolmy Pimentel are all rotation depth options for the Pirates down the stretch. Cody Dickson has been tremendous in Jamestown this year. The fourth round pick threw five shutout innings this week, giving up three hits, one walk, and striking out seven. Dickson has a 1.88 ERA in 38.1 innings, with a 43:15 K/BB ratio. The big concern for the lefty was control, but he has walked six batters in his last 24 innings over five starts, with no earned runs in that span, and 23 strikeouts. Tyler Glasnow went four shutout innings this week, giving up a walk and a hit and striking out seven. The notable thing here is that Glasnow only walked one batter, which continues a downward trend of his walk rates. The top eight pitchers in the system this week combined to go 50.2 innings without an earned run. Graham Godfrey and Joan Montero tied for the final spots on the list, both putting up a 65 game score. Godfrey gave up two runs on five hits and a walk in seven innings for Indianapolis, while striking out seven. 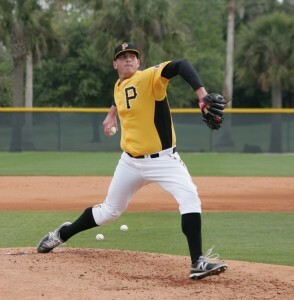 Montero threw five shutout innings for Bradenton, giving up two hits and striking out two. Shane Carle and Cody Dickson were in the top ten. Neil Kozikowski has been consistently on this list each week. The 2013 8th round pick threw four shutout innings for the second week in a row. In his last three starts he has thrown 11 shutout innings, and he has given up just two earned runs in 16 innings on the season. Dovydas Neverauskas has been one of the better pitchers in the Jamestown rotation this year, and bounced back this week after a horrible outing last week. Neverauskas gave up one run in 5.1 innings, looking more like the pitcher we saw in July who gave up a 1.67 ERA in 27 innings. Billy Roth threw four shutout innings in the GCL this week for the fifth best short-season score. The 2013 16th round pick has given up two earned runs in 12 innings. Blake Taylor had the worst start of the week, getting bounced in the first inning after one out due to a high pitch count. Taylor has been excellent in his other outings, but this one really inflated his season numbers. Casey Sadler made two starts this week. The first one was a bad outing, giving up five runs on eight hits in four innings for the second worst start. He bounced back later in the week with two earned runs in seven innings. Kris Johnson is usually in the top ten, but he ended up in the bottom five this week due to leaving his start with a minor arm injury. He was later called up to the majors and made an impressive debut last night. Nate Baker has been getting some starts in the Altoona rotation with mixed results. This week he was hit around, giving up five runs on ten hits in five innings for the fourth worst start. Zack Dodson was the top pitcher last week with seven no-hit innings, but didn’t follow up on that start well. Dodson gave up four runs in five innings to round out the bottom five. Tim,I like watching Bromberg get guys out. But I am not so sure that 88 MPH 4 seamers and 73-74 mph breaking balls will work for a RH in MLB. Particularly as a starter. Why has Lambo not played since being sent down? It takes a few days to travel back. They probably planned on calling Johnson up earlier than they planned on sending Lambo down. All the young arms, very impressive, won’t have to go out and get very many bullpen arms, some of these kids are going to make excellent bullpen pitchers down the road and they still have guys that are injured and will be back next year, like McPherson. When the major league club can call up a pitcher from AAA and they get as good if not better results than the pitchers on MLB roster that is saying something, wish they could do that on the hitting side.